Published on October 11, 2010 by Wade Shepard Follow me on Twitter here. There is now a Commercial Spaceflight Federation, and various aeronautics companies are vying to be first commercial space tourism operators. Tourism will soon go, literally, out of this world. The Virgin Galactic company made new ground recently by releasing its SpaceShipTwo out for a solo flight at 45,000 feet over the Mojave Desert. Apparently, commercial space flight will work along a similar model as the conventional spaceship: a mother ship carries a smaller vessel to a very high altitude and then releases it to fly on its own into space. From space, or so it is my impression, the smaller vessel will fly around the earth’s exterior as tourist take photos of the planet they momentarily left behind before returning home and landing much like a conventional aircraft. SpaceShipTwo was carried aloft by its mothership to an altitude of 45,000 feet and released over the Mojave Desert. After the separation, SpaceShipTwo, manned by two pilots, flew freely for 11 minutes before landing at an airport runway followed by the mothership. But SpaceShipTwo has not yet climbed into space. Though this is a move that should come shortly. 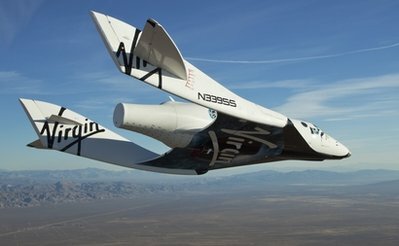 The cost of a ride in space is projected as being around $200,000, and the Virgin Galactic company states that it has already collected in excess of 50 million dollars in down payments from 300 prospective passengers. Space, the final frontier for tourism.